Rugby, be it a match or a training session, can leave your body feeling like a wrung-our sponge. Not only are your energy reserves depleted, but your muscles have also taken a hammering too. 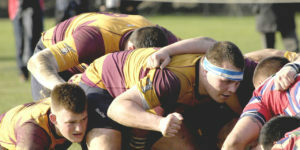 Unlike some sports, such as distance running, rugby players don’t normally have the luxury of several weeks or even months before their next fixture. Instead, most ruggers will be back to training and competing within a day or two. As they age-old saying goes, you are what you eat, and if you want to recover as quickly and completely as possible after rugby, you need to make sure you provide your body with exactly what it needs. In years gone by, especially in countries like the England, Ireland, Scotland, and Wales, post-rugby nutrition involved a pint of beer and a meat pie. Science as now caught up with rugby and so modern post-rugby diet recommendations are a little more specific nowadays! To understand what you should eat and drink after rugby, it’s important to understand what rugby takes out of you. That way, you’ll have a better idea of what you need to put back in. Rugby, being a high intensity, start-stop game, can leave you dehydrated. Water is lost through sweat and also exhaled water vapor. The more you sweat and breathe, the more water you lose and the more dehydrated you will be. Even mild dehydration can interfere with post-rugby recovery and future performance, so rehydrating is critical. Ideally, you will have consumed water and other hydrating fluids during your game or training but, even then, some water loss is inescapable. Some players will lose more water than others and temperature, and the intensity of play or training will also play a part. That leaves most players with the question of how much water to they need to drink? Water weighs around one kilo per liter. Weigh yourself before and after playing to see just how much fluid you have lost. If you started out weighing 91kg and finished weighing 89.5kg, you have lost approximately 1.5 liters of water, and that’s how much you need to consume to replace lost fluids. Alternatively, if your urine is very dark yellow, this also suggests you need to rehydrate. Consume copious amounts of water in the hours after rugby to replace those lost fluids and make sure you are rehydrated as soon as possible. Don’t rely on thirst to tell you if you are hydrated or not – it’s not a very reliable indicator. Instead, make sure you drink to plan, spreading your intake over the next few hours. As well as losing water, your body excretes minerals called electrolytes when you sweat. Including sodium, potassium, and calcium, these minerals have a vital role to play in muscle contractions and maintaining optimal cellular fluid balance, so they need to be replaced. Most sports drinks contain electrolytes, as do fruits and vegetables. Beer contains significant amounts of the minerals magnesium, selenium, potassium, and phosphorus but because alcohol is a diuretic that could lead to greater fluid loss, stick to the alcohol-free variety after rugby if you choose to drink it at all. Your muscles, like the rest of your body, run on adenosine triphosphate, ATP for short. Your body makes ATP in several different ways but, in rugby, the most-used energy pathway is the lactic acid system, also known as anaerobic glycolysis. Glycogen, a form of stored carbohydrate, is partially broken down without the presence of oxygen. Glycogen is found and stored in your muscles and liver. The size of your pre-rugby stores depends on your fitness and your pre-rugby nutrition plan, but a hard game of rugby will invariably leave your glycogen stores heavily depleted. To be able to train or play at the same level of intensity again, those glycogen stores must be replenished, and that means consuming carbs. The sooner you start this refueling process, the better, and the faster you’ll recover. Rugby hammers your muscles in two different ways, both of which cause microscopic muscle damage – called micro-trauma. Big impacts damage your muscles and so too does extreme exertion. Naturally, rugby players face both during playing and training. To halt catabolism or muscle breakdown, and kick-start muscle repair, your body needs protein or, more specifically, amino acids. Amino acids are the building blocks of muscle tissue. The sooner you can ingest decent amounts of protein and amino acids, the sooner the repair and recovery process can start. Delays only mean a slower, less complete recovery. There are three windows of opportunity for maximizing your recovery after rugby. Make the most of each one to ensure that your body is ready and able to play again as soon as possible. It may take some planning on your part, but your efforts WILL pay off. Immediately after exertion, your muscles are a lot like wrung-out sponges that will soak up anything that comes their way. This is because of increased insulin sensitivity. Make the most of this phenomenon by ingesting fast acting carbs and protein, preferably in liquid form, to take care of your rehydration needs at the same time. Liquids are also useful because some players experience loss of appetite after extreme exertion, and fluids are usually much easier to stomach than solids. If you prefer solid food, choose fast acting carbs such as white rice, rice cakes, white bread, white pasta, or potatoes. Pair it with an easy-to-digest protein such as eggs. You can also enhance the immediate recovery process by using a few supplements. Creatine and branch-chain amino acids are very useful during this time and may improve recovery. Creatine replaces lost chemical energy whereas branch chain amino acids (leucine, isoleucine, and valine) are the most heavily catabolized amino acids in your muscles. Once you have kickstarted the recovery process with a fast-acting protein and carb mix, you have some time to pause for thought and organize your next feed. Your insulin sensitivity is still moderately elevated and, hopefully, you’ll also feel hungry now that the post-match excitement has worn off. This all means it’s time to stick your nose in the trough and eat big! As before, your meal should contain carbohydrates and protein to restore depleted glycogen and repair muscle tissue respectively. You also need to continue to consume fluids to rehydrate. Your plate should be made up of at least one-half to two-thirds carbohydrates, such as rice, pasta, potatoes or bread, and a large portion of a protein food such as chicken, beef, or fish. Avoid too much fat as it can delay gastric emptying and, therefore, the refueling process. All subsequent meals should include plenty of non-refined carbs, quality proteins, and healthy fats. Insulin sensitivity will have returned to normal which means slower-acting foods are your best choices. This means goodbye to white rice and hello to wild rice instead. Vitamin and mineral content was not emphasized during the first two windows of opportunity but, now, you should make sure you include plenty of brightly colored fruit and veg to provide your body with the micronutrients it needs to stay healthy. Ensure you continue to hydrate by drinking yet more water. If you want to train and play at your best, it’s crucial that you eat to maximize recovery. Recovery CAN happen passively, but you’ll recover more quickly and completely if you eat the right kinds of foods at the right times. Plan your nutrition in advance so that you know what to eat and when. If you are serious about performing at your best, you need to be serious about recovery too!